Yesterday, we commemorated World Elder Abuse Awareness Day 2016 by presenting an online tutorial, entitled Strategies for Keeping Older Adults Safe from Financial Predators, for professionals who work with older adults. Lorraine Geraci, CPC, veteran trainer and member of NRMLA’s Education Committee, did an exceptional job explaining the different types of financial abuse, describing common scams and fraud perpetrated against seniors, helping attendees recognize the warning signs of abuse and exploitation, and providing a list of resources for reporting abuse and supporting victims. 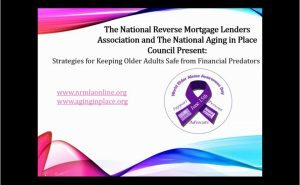 In case you were unable to attend the tutorial or simply want to listen to it again here is a link to the recording, NRMLA and NAIPC Present: Strategies for Keeping Older Adults Safe From Financial Predators.